It’s not a wedding without cake. A wedding cake provides more than just a dessert for guests, it’s a focal piece for the reception when it comes to style and design. Our 2017 brides used their unique style to design their beautiful sweet treat. 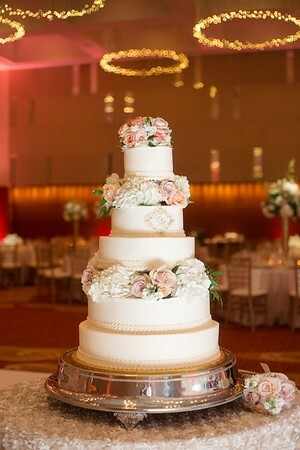 Lauren and Ryan displayed a gorgeous 4-tier cake that was decorated with flowers. The flowers added that elegant touch and the bouquet on top tied it all together. 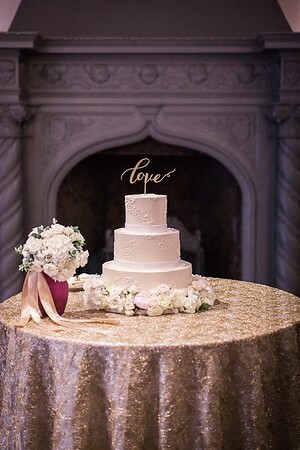 The couple’s gold monogram on the top tier gave the cake a personalized touch. Encore Baking’s beautifully designed cake made Lauren and Ryan’s wedding even more perfect than it already was. 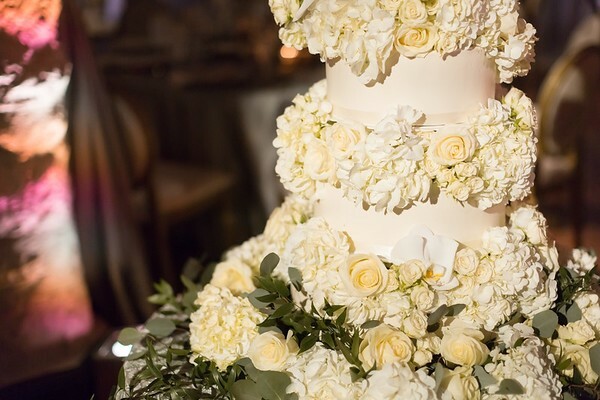 Elise and Ben had a beautiful five-tier cake that was show stopping. The flowers were on display and added a pop of color. The cake was simple but elegant and the detailed piping completed the look. The Cakery did a wonderful job creating this dessert for Elise and Ben’s special day. Shaterra and Jordan’s wedding was nothing short of extravagant. 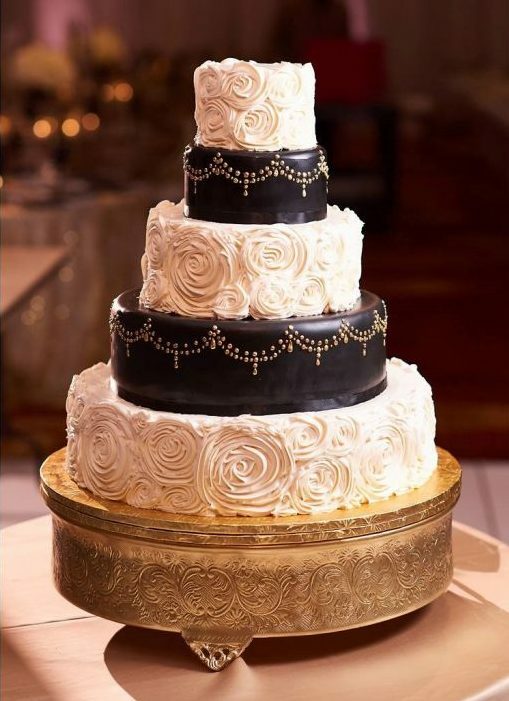 They had an elegant five-tier cake that incorporated their colors of white, black, and gold perfectly. The beautiful hand-crafted flowers added a special touch to their dessert. McArthur’s brought Shaterra and Jordan’s dream to life. 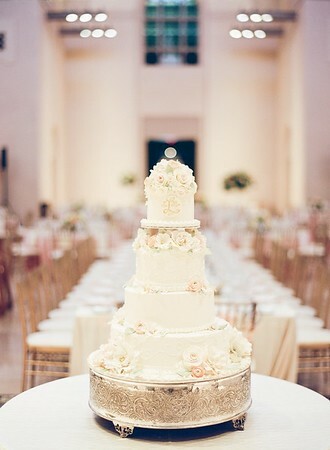 Lisa and Zach had an incredible five-tier cake at their wedding. 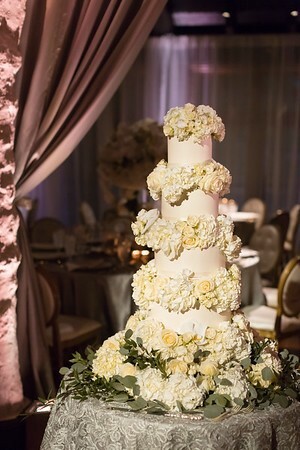 It was covered in beautiful white and ivory fresh flowers that were complimented with touches of greenery. 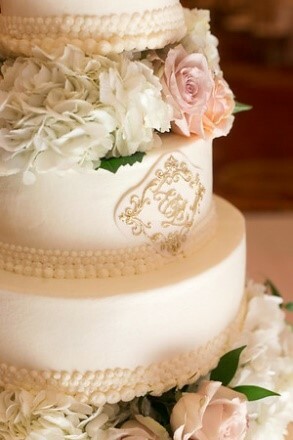 The cake itself was simple and elegant, but the flowers brought in the detail that it needed. The cake really was the main focal point. This cake by Sugaree Baking was even more delicious than it appeared! Jayne and Alex had a simple but beautiful three-tier cake. The white flowers along the bottom of the cake was a nice way to tie everything together. Detailed piping on the tiers provided a touch of elegance and the custom topper was perfect. Sarah’s Cake Shop did a perfect job for Jayne and Alex.